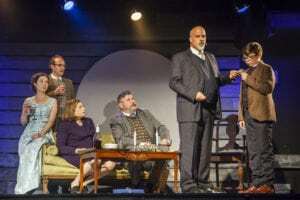 Review by Karen Topham, American Theatre Critics Association member; photos by Marisa KM. It isn’t often that you see a musical in which the main character scowls for pretty much the whole show, but in Caroline, or Change, the title character has plenty to scowl about. Played by Rashada Dawan in a transcendent performance, Caroline is a divorced maid in 1963 Lake Charles, LA, trying to feed a family of four kids on her meager $30/week after breaking off her relationship with an abusive husband. Her best friend is trying to move on from the service life by taking college classes at night, but Caroline is stuck in a dead-end job with only daydreams of a relationship with Nat King Cole to sustain her. In anyone else’s hands but Tony Kushner’s, this story might be bleak as all heck. But Kushner (Angels in America) adds just the right touch of whimsy to the play (a singing washer and dryer, a trio of singers to play the part of “Radio” as a kind of Greek chorus, a singing bus, and a gorgeous, glowing, singing moon) to the award-winning music of Jeanine Tesori (Fun Home) to keep it from becoming too dark. And in director Lili-Anne Brown, Firebrand Theatre has found someone who is capable of keeping this complex sung-through play in balance. From the opening notes, we are told that this is a small, personal story. Caroline sings, “Nothing ever happen underground in Louisiana cause they ain’t no underground in Louisiana. There is only underwater.” Louisiana’s water table is so high that they simply can’t have basements, a fact alluded to several times in this musical. And since the play takes place largely in a basement laundry room “underground in Louisiana…sixteen feet below sea level,” we know from the start that not much of massive import will occur and that the entire show is built on a magical premise. The story is simple: Caroline’s employer (Jonathan Schwart) has lost his wife and remarried with her best friend Rose (Blair Robertson), who is having trouble reaching past her stepson Noah’s (Alejandro Medina) anger about his mother’s death. Noah would rather hang out in the basement with Caroline as she does laundry; he feels a unique bond for this woman who allows him to light her daily cigarette despite her perpetual anger. Caroline’s oldest daughter (Bre Jacobs) is becoming more and more independent with dreams of being better than her mother, who is stuck, economically “underwater,” with nothing to look ahead to. When Rose offers to supplement her small income (and teach her stepson a valuable lesson about money) with whatever change Noah leaves in his pockets, it sets up an internal conflict within Caroline: should she take money from a 9-year-old to ease her life? For his part, Noah (who hates his stepmom and whose father is despondent over his wife’s death and unavailable emotionally) secretly begins leaving the money intentionally, trying to insinuate himself more and more into her good wishes. Meanwhile, JFK’s assassination focuses everyone’s attention on the changes going on in the world. 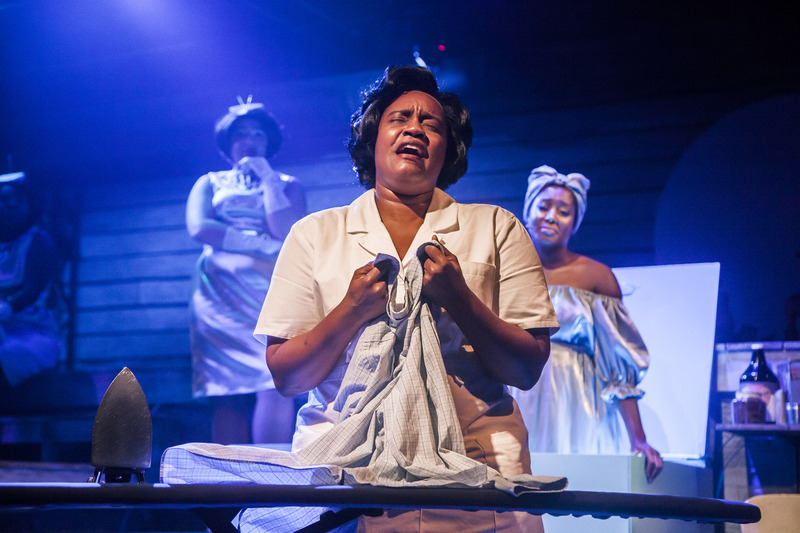 Caroline, or Change is a compelling, impressive musical centered on a dominant performance by a gifted actress. Brown’s design team (Cat Wilson on lights, Victoria Dioirio on sound, and Lauren Nichols on scenic design) provides her with solid technical support, and Kotryna Hilko’s costumes range from perfectly appropriate (the realistic ones) to sublime (the whimsical ones). The Radio chorus (Roberta Burke, De’Jah Jervai, and Emma Sipora Tyler) are wonderful, and the other minor characters (Micheal Lovette, Kevin M. Grubbe, Rosalind Hurwitz, and Michael Kingston) bring their own touches of humor or drama to the show. And Brown herself directs with a sharp sense of movement and timing as well as the clear ability to get outstanding performances from her cast. Firebrand Theatre, which burst onto the scene with last year’s Lizzie and 9 to 5, is quickly becoming a force to be reckoned with. If its first three shows are any indication, “the world’s first equity feminist musical theatre company” will have a long, successful life. 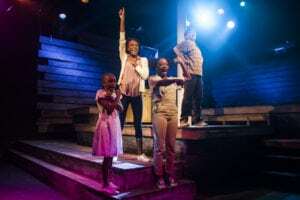 Caroline, or Change is a Firebrand Theatre production in partnership with Timeline Theatre, now playing at the Den Theatre, 1333 N. Milwaukee, Chicago until Oct 28. Performance times vary; check the website at Firebrand Theatre for tickets, schedule and times. Find more information about current plays on our Current Shows page and at theatreinchicago.com. ⟵“We’re Only Alive For a Short Amount of Time”…so go see this play!